Beginning last year, all students at Evergreen School began taking swim lessons. It was agreed upon by the staff that in an area with as many lakes and beaches as Kenora, that our students must be equipped with swimming skills and water safety knowledge in order to be safe. 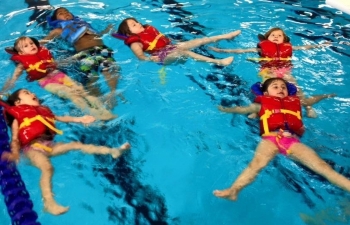 With many drownings being reported in the news each summer, it is imperative that we do whatever we can to ensure that our students know how to swim and safe practices around water. The costs, including transportation to and from lessons can be quite costly, but at Evergreen we do not leave students out of any activity if cost the barrier. In order for us to maintain this great program, we are now looking elsewhere to help fund our students. Here's how you or your business can help! If you are interested in sponsoring a swimmer to participate in Red Cross swim lessons, make a donation of $25 per swimmer. Challenge your co-workers or your family to match your donation! Come by the school or join us Oct 5th at the Kenora Farmer's Market to make your donation. We thank our community for the on-going generosity and care! !